Pioneers in the industry, we offer e plus e make moisture in oil transmitter, compact moisture in oil transmitter, moisture in oil transmitter, dew point and temperature transmitter and compact dew point transmitter from India. The probe can be employed up to 180 DegreeC (356 DegreeF) and 20 bars (290 psi) and is available with either ISO or NPT slide fitting, which allows for variable immersion depth. Using the optional ball valve, the probe can be mounted or removed even without process interruption. The rugged polycarbonate enclosure facilitates easy mounting and maintenance. The measured values are available on two analog outputs and on the Modbus RTU interface. An optional relays module can be used for alarms and process control. The state of the art TFT color display can show all measurands simultaneously and offers extensive error diagnostics. The integrated data logging function saves all measured data in the internal memory. The logged data can be displayed in a graph directly on the device or easily downloaded via USB interface. Compact Moisture In Oil Transmitter are specially designed for the measurement of water content in oil. EE381 is ideal for online monitoring of moisture in lubrication or insulation oil, which is very important for the long-term performance and preventive maintenance of plant and machinery. For instance, moisture affects dramatically the insulation characteristics of electrical transformer oil and therefore continuous monitoring is extremely important. aw = 0 corresponds to water-free oil, while aw = 1 indicates saturated oil. 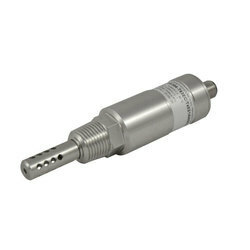 aw measurement with the EE381 transmitter is based on the outstanding long term stability and resistance to pollution of the E+E capacitive sensor elements series HC. The measured physical quantities are water activity aw and temperature T. With these quantities EE381 calculates the water content x (ppm) in mineral transformer oils. Calculation of water content (ppm) in non-mineral oils and lubrication oils can be achieved by programming the specific parameters of the oil into the EE381. The EE381 transmitter has two freely selectable and scaleable outputs for water activity, water content or temperature. The EE381 switch with two relay outputs is designed for control and alarm purposes. The status for early warning and main alarm is indicated by LED's. Adjustment of the aw/T/ppm set point and hysteresis can be achieved with the optional configuration software. The optional configuration software allows flexible and easy adjustment of the analogue resp. relay outputs to the respective requirements. 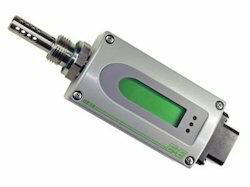 The adjustment / calibration of the transmitters can easily be performed. The construction of this screw connection enables any position / rotation of the mounted transmitter. So an optimal position of the display resp. the cable outlet is guaranteed. The EE364 is an innovative moisture in oil transmitter, suitable for OEM applications. The high measurement accuracy and excellent long-term stability make the EE364 ideal for online monitoring of moisture in transformer, lubricating and hydraulic oil, as well as diesel fuel.The compact design and rugged stainless steel housing allow a space-saving installation in the most demanding applications. 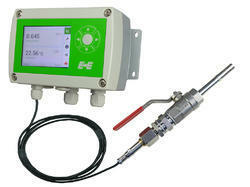 The EE364 measures water activity (aw), oil temperature (t) and calculates the absolute water content (x). The measured values are available on two 4-20mA outputs and one digital output with MODBUS RTU interface.The analog outputs can be individually scaled and configured using the optional converter cable and the free EE-PCS Product Configuration software. Exact dew point monitoring is increasingly playing a more impor-tant role in many industrial applications, such as drying process-es, air pressure pipelines, etc. For these purposes the multifunc-tional EE35 Series offers the ideal features.The EE35 Series is based on a functional, user-friendly housing concept and on the proven polymer humidity sensors of the HC Series. A specially developed autocalibration process enables measure-ments in a measurement range of -6060 DegreeC Td (-76140 DegreeF Td), with a Td measurement accuracy of +-2 DegreeC (+-3.6 DegreeF).Two freely configurable and scalable analogue outputs are available for the two measurement values (Td, T). An optional hygrostat output, which can be set by means of a potentiometer, provides an alarm signal in a simple way when a threshold of the permitted dew point is exceeded.An optional display for the measurement values and the associated MIN/MAX values allows a quick overview of the current situation. Dew points in the range of -60-20 DegreeC (-76-4 DegreeF) at room temperatures correspond to relative humidity values of 0.085.37% RH. The measurement of such low humidity values is not possible with conventional capacitive measurement methods. For the EE35 Series, a special autocalibration process is used to compen-sate for the usual drift effects and thus to achieve high accuracy measurements also at -60 DegreeC Td (-76 DegreeF Td). In addition to the direct mounting of the dew point probe, a ball valve installation enables the mounting and removal of the probe without having to interrupt the running process. An optional alarm module with one relay output is available for control and alarm purposes. The setting of the Td threshold can be easily done with the potentiometer on the printed circuit board. A power supply, integrated in the back module of the housing, can be ordered optionally (100240V AC, 50/60Hz; ordering code V01). The power supply V01 is available for both polycarbonate and metal housing and comes standard with two plugs for supply and outputs to allow an easy connection. 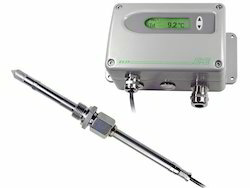 The exact monitoring of dew point temperature in compressed air systems, dryers for plastic and other industrial processes is becoming increasingly more important.Compact Dew Point Transmitter (Series EE-371) with a measuring range -6060 DegreeC Td (-112140 DegreeF Td) is the ideal solution for such applications.The core of the transmitter is the monolithic measurement cell type HMC01, developed by E+E Elektronik in thin-film technology. An autocalibration procedure which is integrated in the device and years of experience in low humidity adjustment make an accuracy of <2 DegreeC Td (+-3.6 DegreeF Td) possible. The compact construction in a robust aluminium housing and the numerous options allow easy mounting and many application possibilities. Dew point temperatures in the range of -60-20 DegreeC (-76-4 DegreeF) at room temperature correspond to relative humidity values of 0.085.37% RH. The measurement of these low humidity values is not possible with conventional capacitive measurement methods. For the EE371 series a special autocalibration procedure is utilized to achieve high accuracy measurements at lowest dew points too. Model T The transmitter has two freely selectable and scaleable outputs for dew point, frost point or ppm volume concentration. Model S The switch with two relay outputs is designed for control and alarm purposes. The status for early warning and main alarm is indicated by LED's. Adjustment of the Td/Tf set point and hysteresis can be achieved with the optional configuration software. The optional configuration software allows flexible and easy adjustment of the analogue resp. relay outputs to the respective requirements.The adjustment / calibration of the transmitters can easily be performed. The construction of this screw connection enables any position / rotation of the mounted transmitter.So an optimal position of the display resp. the cable outlet is guaranteed.